Campey Turf Care Systems supply the Sisis range. Listed below is a small selection of the Sisis range, please get in touch to find out more about the full range available from Campey, simply call +44 (0)1260 224568 or email us today. 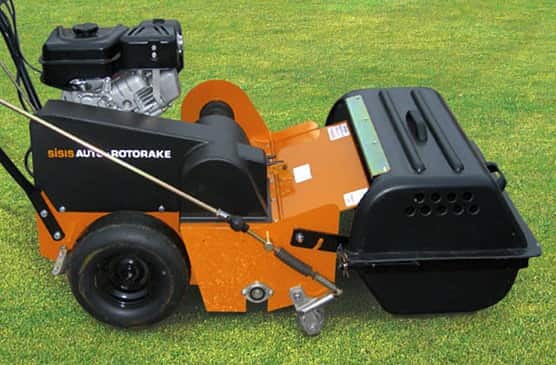 Rotorakes 450 & MK5 – Easy to use Scarifiers for maximum thatch control and removal. 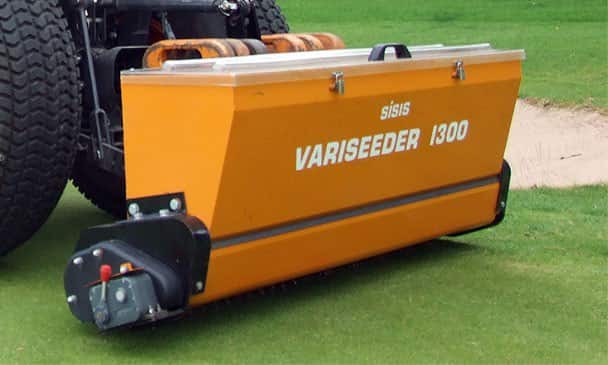 Sisis pedestrian Scarifiers use contra-rotating reels for a clean consistent performance, perfect for fi ne turf surfaces. Lightweight and easy to manoeuvre, these pedestrian Scarifiers have been specifically designed to allow a range of interchangeable reels to be used for all year round maintenance. Maximum thatch control and removal helps to reduce the risk of disease, encourage ‘up right’ grass growth and a ‘true’ playing surface. .
A specially designed tractor mounted unit with a choice of five quick release interchangeable reels to aid the removal and control of thatch and help to reduce standing surface water by improving water infiltration. Features include a contra rotating reel for a clean consistent performance with a selection of various blades to suit key tasks. The weight of the collection box and material is carried by the main frame on the front roller and independent from the reel, so when in use the additional weight does not force the reel to scarify deeper than has been set. 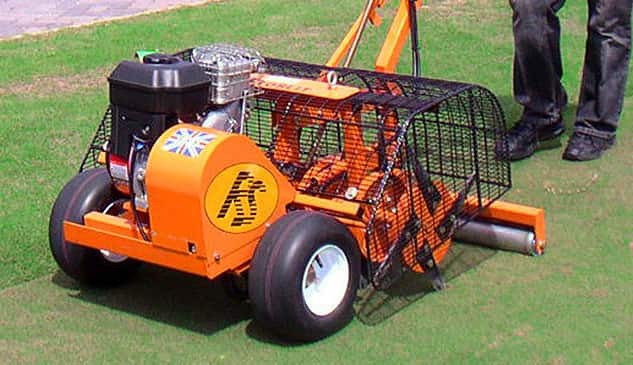 A purpose designed, triple mounted hydraulic driven scarifier using strong cutting blades for maximum thatch removal and minimum surface disturbance. The three independently floating heads follow ground contours closely without scalping. Depth of cut is infinitely variable by means of a locking micro–adjuster on each unit. 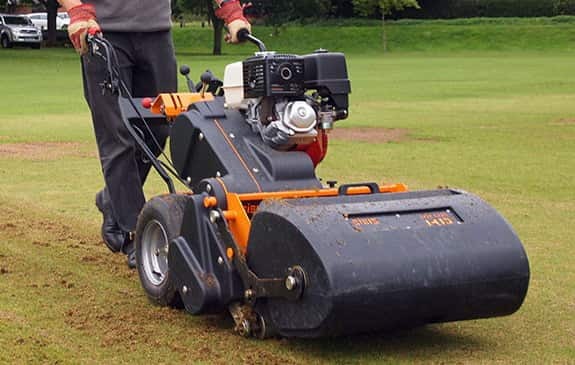 A choice of 1mm or 2mm tungsten tipped blades are available to carry out scarification and verticutting requirements. • Vertical penetration and with drawl with minimal surface disturbance. The Sisis Javelin and Javelin Aer-Aid machines are specially designed tractor mounted vertical action aerators for use on both fi ne and outfield turf. 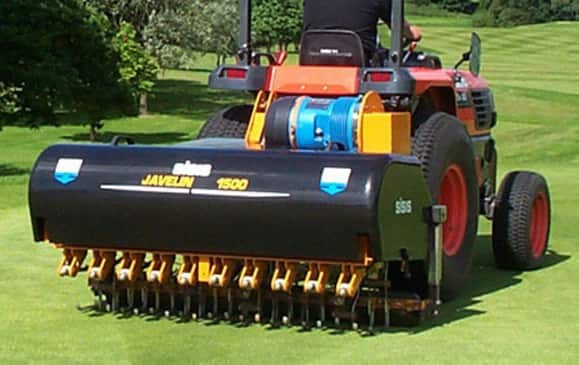 The machines can be used all year round due to the large selection of tines helping to break up compaction allowing water, air and nutrients to penetrate the root zone. Consistent use helps to produce a surface that is less affected by the adversities of weather conditions leaving minimal disturbance. The aer-Aid system injects air directly into the root zone speeding up the aeration process, moving air uniformly throughout the root zone for complete aeration – not just where the tines have penetrated. The cam trigger mechanism ensures that the air is always expelled at the bottom of the tine penetration enabling treatment to be targeted precisely. 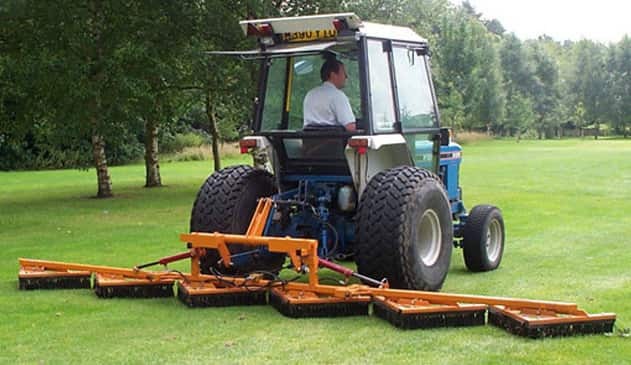 Simple design with low maintenance, the Multitiners are drum type tractor mounted aerators for use on fi ne turf surfaces and sports fields and are well suited to performing a range of various aeration methods such as solid, chisel and hollow tining. Fast and effective, these aerators will leave minimal surface disturbance. 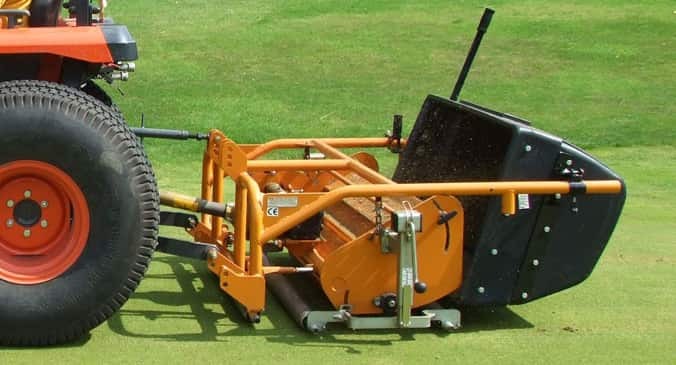 The Rolaspike is a tractor mounted sarel type roller which is ideal for surface aeration assisting with the absorption of water, air and nutrients into the turf. Also useful as part of an overseeding programme preparing the surface for seed. 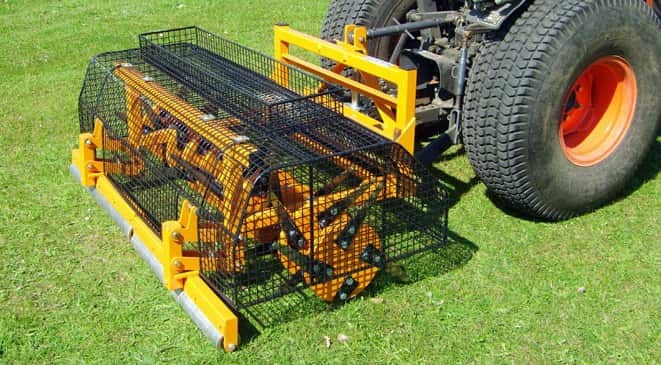 A purpose built pedestrian deep slitter which is suitable for use on fine or outfield turf helping to reduce compaction and assist the percolation of surface water. The deep clean slitting action cuts through the turf and the root zone leaving a thin slit on the surface and minimal surface disturbance. These slits encourage strong, healthy root growth of the grass plants, improving tolerance to drought conditions and promoting more rapid recovery after damage in play. Easy to use the Autoslit incorporates a rear smoothing roller and uses a cantilever system to lift the machine out of operation. • Choice of interchangeable slitting tines to suit different ground conditions. • The angle of the tines and spiral design of tine shaft assist penetration giving maximum underground cultivation with minimum surface disturbance. • Tine plates have a wide rim to reduce marking in soft or undulating conditions. • Safety guard is quickly removed for easy tine change. Tractor Mounted Deep Slitters – Optimum aeration for maximum health. 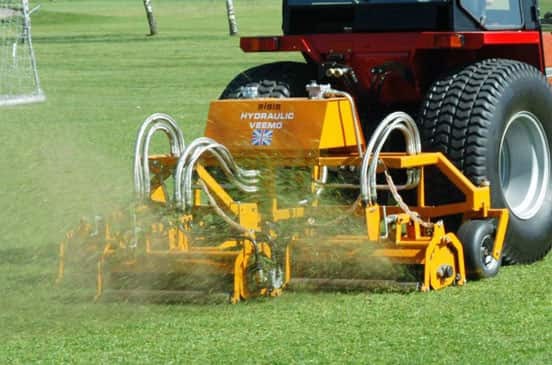 Deep slitting aerators work… with minimal surface disturbance for the ultimate finish. Built to last, a range of tractor mounted deep slitters for both outfield and fine turf. Different working widths and varying maximum depths allow a model to be selected to suit any tractor and most applications. These machines are simple in design and low maintenance. Their thin sharp blades cut through the turf and root zone leaving only a slit on the surface but giving deep optimum sub soil disturbance. 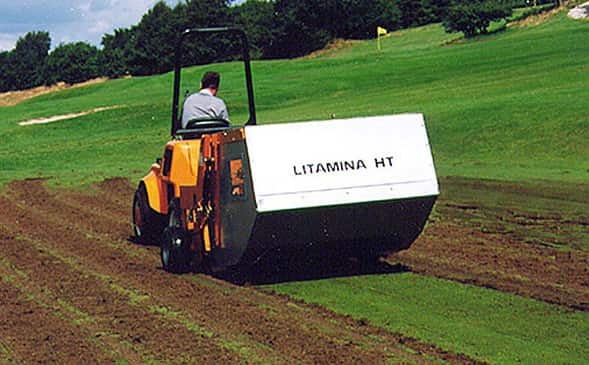 Regular slitting encourages strong, healthy root growth of the grass plants, improving tolerance to drought conditions and promoting more rapid recovery after damage in play. 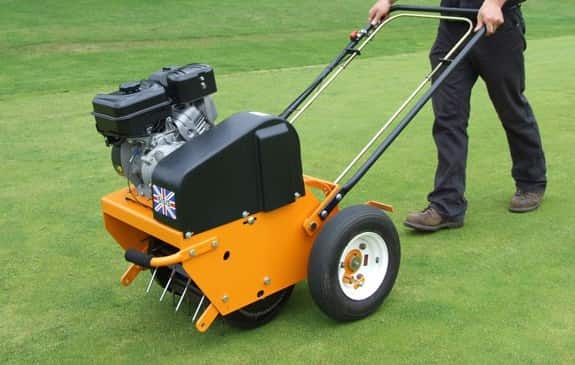 Versatile maintenance equipment trusted by professional groundsmen for a variety of applications. 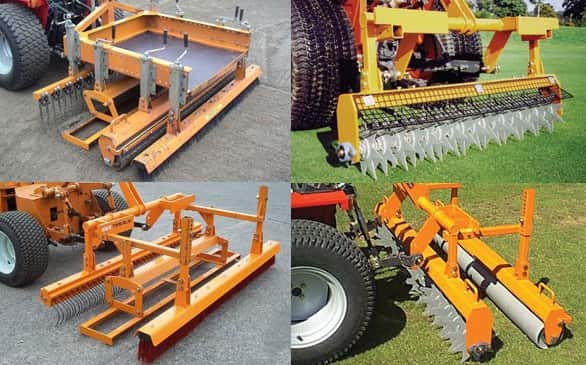 Implement Mounted Frames Single pass maintenance system which accepts a variety of implements for use on both turf and hard porous surfaces. Up to four operations can be carried out simultaneously with this simple and versatile system. All implements are fully interchangeable and independently adjustable to give the desired effect and can be raised out of use when not required. Connects to any tractor with 3 point linkage and utility trucks with suitable frame. 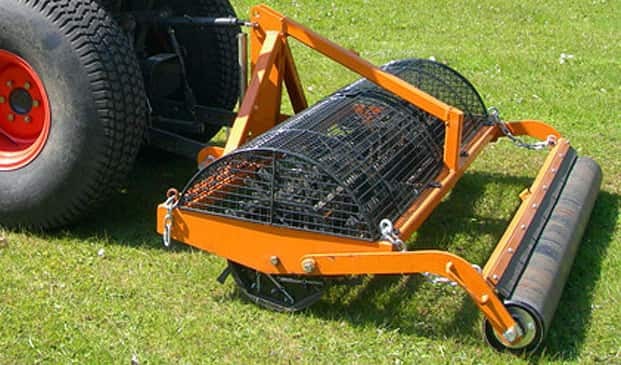 Towed Implement Frames Ideal for towing behind small compact tractors when hydraulic lift is not available. The system can use implements singly or in pairs by using the optional extension arms. A compact and versatile tractor mounted overseeder ideal for renovation and repair work. The studded roller prepares the seedbed by creating thousands of little “plant pots” to receive the seed without linear grooves that can disturb play. 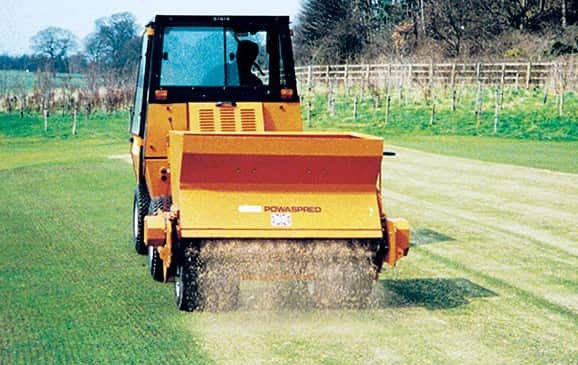 Variable seed rates and options on discharge rollers allow different seed varieties to be introduced to the sward. Enhance the aesthetic presentation of your pitch. Sweepers specially designed for large areas. Collection and removal of surface debris is an important part of any maintenance programme. 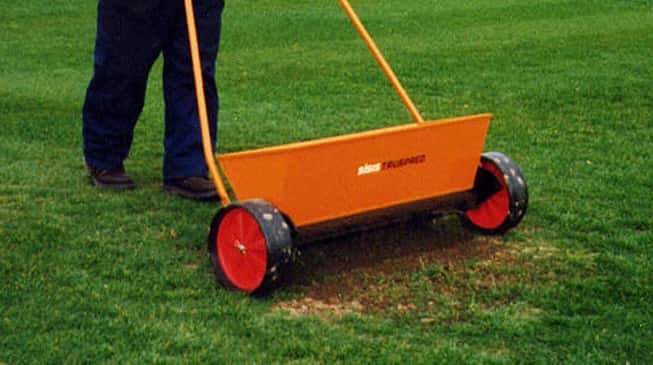 Whether it is following scarifying or core aeration or simply collecting leaves or litter, the process must be carried out without damaging the turf. 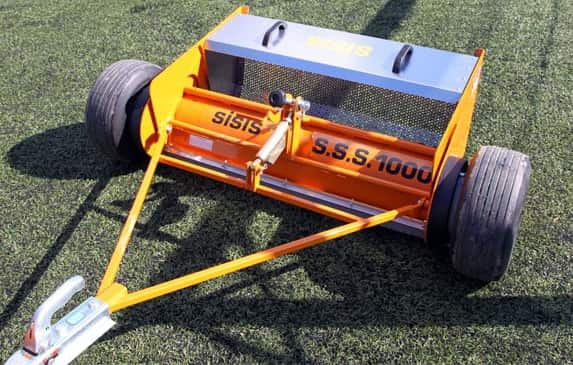 Ideal for fi ne or outfield turf the Sisis range of easily adjustable tractor sweepers have spiral designed brushes that drive the debris into large capacity hoppers whilst following ground contours. Ideal for collecting debris on areas of fi ne turf or picking up leaves in a car park. The spiral designed brush drives the debris into the hopper whilst following ground contours. The Powaspred will spread most free flowing materials including sand, loam, rock salt, rubber crumb and hard porous dressings at the desired rate with an even consistent spread. A range of tractor mounted brushes designed for fast effective brushing on large areas such as golf fairways and sports grounds. Ideal for brushing in top dressings, dew dispersal, striping for improved presentation and lifting grasses prior to cutting. The brush sections on the Flexibrush model float to follow ground contours with the outer sections folding hydraulically for ease of transport and storage. The Varibrush model has a multiple brushing action to allow maintenance to be completed with fewer passes therefore reducing compaction. A choice of three mounting options are available for the Varibrush ensuring it can be used on a variety of vehicles. A versatile hand operated spreader and top dresser for the accurate even application of grass seed or top dressing material. Particularly useful for applying top dressing to small areas such as cricket squares, bowling greens, golf greens and tees and lawns.